4. Will my jaw be sore from being slightly forward during sleep? The average person requires an adjustment period of 2 to 3 weeks to reach maximum comfort. During this period you may feel a slight discomfort in the jaw area but this will disappear a few minutes after removing The SnorBan® mouthpiece. Oral mandibular advancement devices have been clinically proven as one of the most effective and successful ways to cure snoring. These type of devices have been prescribed by dentists and physicians for years. 6. Who can use SnorBan®? 7. What is the SnorBan® mouthpiece made of? 8. 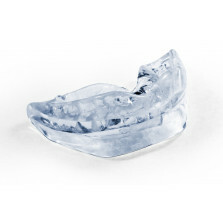 Is The SnorBan® Mouthpiece hard to fit? 9. Does one size fit all? 10. What is the possible side effects? 11. Can I use SnorBan® if I have a blocked nose or nasal obstruction? 12. How long will a SnorBan® last? 13. How do I clean my SnorBan®?